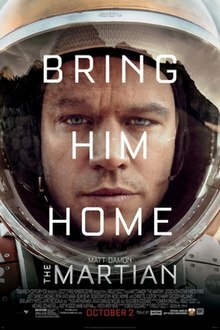 ^ a b c "The Martian (EN)". Lumiere. Retrieved June 24, 2017. ^ Jimmy Kimmel (host) Naomi Scott (guest). Naomi Scott on Being in The Martian with Matt Damon. Clip from "Dave Chappelle, Naomi Scott, Music from Weezer". Jimmy Kimmel Live!. Season 15. Episode 38. March 21, 2017. ABC. Retrieved April 30, 2017. ^ a b Webster, Guy; Agle, DC; Brown, Dwayne; Cantillo, Laurie (September 28, 2015). "NASA Confirms Evidence That Liquid Water Flows on Today's Mars". NASA. Retrieved September 28, 2015. ^ a b Chang, Kenneth (September 28, 2015). "NASA Says Signs of Liquid Water Flowing on Mars". The New York Times. Retrieved September 28, 2015. ^ "Mars covered in toxic chemicals that can wipe out living organisms, tests reveal". The Guardian. Retrieved November 26, 2018. ^ "Toxic Mars: Astronauts Must Deal with Perchlorate on the Red Planet". space.com. Retrieved November 26, 2018. This page was last edited on 20 April 2019, at 23:15 (UTC).